Mythic Minis: Feats of of the Monastic Master brings you 14 mythic feats for masters of monks way, channeling their inner spirit into a perfect synergy of the material and the mystical. You'll find feats for fighting like Quarterstaff Master and Tripping Twirl alongside feats blending monasticism and magic like Hex Strike, holy faith with ascetic practice like Crusader's Flurry, and feats of impossible agility like Cloud Step and Ki Stand! -Cloud Step: Air walk full slow fall distance, remain aloft via ki. COOL! -Cockatrice Strike: Use as a standard action, petrify non-mythic creatures on any hit. -Crusader's Flurry: Expend channel energy to increase potency of flurry of blows damage, also +atk when expending mythic power. Damn cool, though this can make you a pretty fearsome shredder. In the hands of the right player, this may be very nasty, even for a mythic campaign. -Deny Death: Use mythic power instead of ki to stabilize and get + number of ki points remaining as a bonus to saves versus death effects. I really like the aesthetics of this feat - the less life energy, the more susceptible to death effects - reminds me of a great many masters and how they died in WuXia movies. Two thumbs up! -Domain Strike: Use it as a free action or with +tier bonus to cleric level to determine its effects. Solid, but boring. Beware: If your campaign deviates greatly from the "2 levels equal roughly 1 mythic tier" convention, this may be broken for you. -Hex Strike: Same as domain strike, just for hexes; same caveat applies. -Ki Stand: No more AoO; for ki and/or mythic power, you can also move when standing up. Nice flexibility increase! -Monastic Staff: Temporarily make your staff ki focused as per the property and increase its potency via mythic tier. -Quarterstaff Master: Better 1h your quarterstaff and potentially temporarily break the +5 limit on enchantment via mythic power. Not a big fan of the latter, though it helps keep the weapon relevant. -Revelation Strike: Same as domain strike, for revelations. -School Strike: Same as domain strike, for arcane schools. -Spider Step: Like cloud step, only for spider step. -Touch of Serenity: Better efficiency versus non-mythic targets, use mythic power to use it as a touch attack; can be used more than once per round, including in a flurry. Solid. -Tripping Twirl: Better trip; If you're also a magus and follow trip with spellstrike, you receive +4 to overcome SR. *Generally* pretty awesome and I love the class-specific bonus, though I do think the bonus should scale. That being said, formatting-wise, the additional benefit would usually be reserved to a "Special:" - line analogue to the non-mythic feat. Editing and formatting are good, I noticed no significant glitches. Layout adheres to Legendary Games' 2-column full color standard and the pdf has no bookmarks, but needs none at this length. 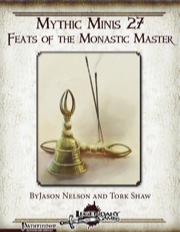 Tork Shaw and Jason Nelson provide quite a bunch of feats herein - this mythic mini is pretty much chock full. That being said, some feats feel slightly less inspired to me than in regular mythic minis - while I love the multiclass feat tricks in general, and yes, my gripe with them is highly situational, it is a gripe. I love the linking of ki and mythic power and while I do consider crusader's flurry a tad too strong, I am quite sure that for some character out there, this will be just THE feat. All in all, though, these feats are pretty much ranging from solid to awesome and provide quite some flexibility. In the end, I will settle on a final verdict of a solid 3.5 stars, rounded up to 4 - a good pdf for the price point, if not as mind-blowing and tactics-changing as other mythic minis.